The Lake Minnetonka Association’s Milfoil-Free Minnetonka Vision and Plan recommends inspection fees as one way to help pay for the aquatic invasive species (AIS) protection and control programs we recommend. The access fee issue has raised some healthy discussion. Here I would like to add further clarification. First of all, the Lake Minnetonka Association believes Lake Minnetonka is a public resource and that no method ought to unreasonably restrict access to this public resource. While fees are a departure from our past practice, we believe we must change the game if we are to protect Lake Minnetonka. We liken these fees to fees required to enter state parks, both would be used to manage and protect the public resource people come to enjoy. Secondly, I am not aware anyone disagrees with the notion that AIS – those now in Lake Minnetonka or those yet to arrive – pose serious, real and irreversible threats. The potential damage caused by zebra mussels, VHS, spiny waterflea, hydrilla and many more is so great that prevention is the first and sometimes the only line of defense. Thirdly, we have recommended a comprehensive management and protection program with an annual budget of $600,000 – and the Lake Minnetonka Association has committed to contributing 25% of this. While this may seem to be great, let’s put it into perspective. Lake Minnetonka is large, comprised of dozens of interconnected bays. Therefore, Lake Minnetonka ought to be considered as more than a single, small lake. Lake Manitou (Indiana) spends $500,000 per year to control a single species, hydrilla. Lake Manitou is only 700 acres (Lake Minnetonka is 14,000 acres). 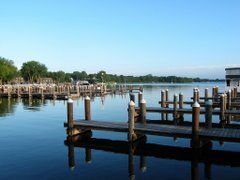 Lake Minnetonka has numerous access points, special events and is a regional resource. Finally, the key element to a comprehensive protection program involves inspections to assure boats and trailers arrive dry inside and out. It has been suggested that AIS could evade inspections, because they are often small or inconspicuous. However, most AIS will not be introduced when there is not water carried from a contaminated lake or river. So, inspections can be effective. Since AIS move by watercraft, the likelihood of an AIS introduction is proportional to the mode of movement. Therefore a fee associated with the boat launching is appropriate. The Lake Minnetonka Association notes however, that LMCD Executive Director was recent quoted as saying, “Can more be done? Yes. We are willing to do more. But we have budget constraints.” In addition, the LMCD’s “Management Plan for Lake Minnetonka” includes policies and recommendations for inspections of watercraft at all public and private accesses, and further, they recommend inspections should be paid for by fees assessed to watercraft owners at the time of inspection. There appears to be no argument that more AIS prevention is needed and that inspections are a key element to that program. At issue is how to fund such a program. Some have argued the state should support these protection activities. However, the reality is the state’s grant program for AIS prevention is $100,000 per year – for the entire state! With these numbers, we are not even in the ballpark to help Lake Minnetonka. The Lake Minnetonka Association is open to any source of funding that is adequate to protect Lake Minnetonka from AIS. We have considered alternatives and have recommended inspection fees as one source because these are equitable and proportional to how AIS enter lakes. Further, we have recommended that fees collected at Lake Minnetonka be dedicated to protecting Lake Minnetonka. The Lake Minnetonka Association’s underlying interest is to protect the lake. In that vein, any viable method to accomplish meaningful and comprehensive protection should be on the table. We hope and expect that our proposals will be critically scrutinized and if better alternatives are available to protect Lake Minnetonka, they should be brought forward and considered. Until that time, we are in a situation where there is a recognized and legitimate need for protection and we must find new ways to address that need. We know that the proposed access fees will be controversial; but inaction or inadequate action is also at issue. The AIS threat will not go away. We believe the inspection fees we propose are justified and appropriate. While this proposal should continue to be discussed, we hope that discussion will occur in the context of the comprehensive vision and plan we have put forward. How does the association recommend drying the bunks on ones trailer? It seems to me that 100% of boats with bunk type trailers will be refused entry based on the "Completely Dry" rule. This wouldn't be a ploy to keep Minnetonka to only the landowners, would it?? ?